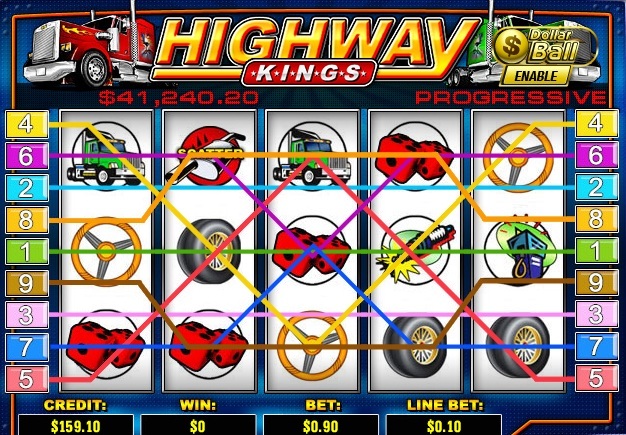 Highway Kings Slots is a very nice slot game, with amazing decoration, from the creators of the best online slots games – PlayTech. It is a bonus, video, or so called feature, slots game with 5 reels, but only 9 paylines. However the winning combinations are 41 and in a way they compensate the low amount of paylines for a 5 reels slots game. The jackpots are very generous as well. The big jackpot is of an amazing 10 000 coins and the second jackpot is of 1000 coins. The coins sizes are varying from $0.01 to $5.00, which is a very good variation of choices to bet from. Moreover the max coin amount you can bet is 9. 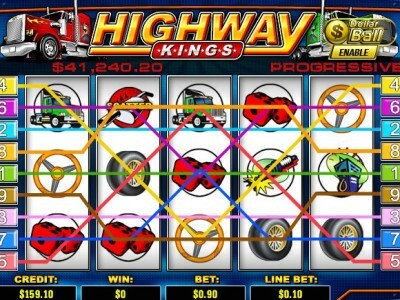 The theme of the game is trucks and highways, and the designs of the game are very good. Also the art is professionally made. The symbols are varying from a truck, a dice and a wheel to a plunger and petrol pump. The wild symbol is a red truck and the scatter is a spark plug. There aren’t any multipliers in the game, but there is a bonus game – dollar ball and an autoplay mode, which are a great addition to it.